OAKLAND, Calif. (AP) Even when Stephen Curry isn’t at his best he can still be downright brilliant. Curry scored 32 points and dished out nine assists in another superb performance during his sensational recent stretch, and the Golden State Warriors beat the Nuggets 124-114 on Monday night to avenge an ugly home loss to Denver in late December. Klay Thompson scored 19 on his bobbblehead night while Draymond Green added a season-high 23 points and 10 assists in the defending NBA champions’ fifth straight victory on a night when Kevin Durant sat out his third consecutive game with a strained right calf. Nikola Jokic had his first triple-double of the season with 22 points, 12 rebounds and 11 assists as four players scored 20 points or more for the Nuggets, who were coming off a 106-98 loss at Sacramento on Saturday. In his 12th 30-point game of the season, Curry hit a long 3-pointer with 56.1 seconds left in the third and the Warriors led 93-81 going into the final quarter after the Nuggets had fought back to tie it midway through the period. Curry shot 9 for 17 overall, including 5 of 10 from 3-point territory. The two-time MVP has scored 29 or more points in seven straight games. In four games before Monday, he was averaging 36 points, six rebounds, 4.8 assists and 1.3 steals in 31.8 minutes since returning from an 11-game absence due to a sprained right ankle. The Western Conference player of the week for last week, Curry strained his left knee in the first half, headed to the locker room to have it taped and then returned. West contributed 10 points, scoring in double figures for a third straight game to go with six rebounds and four assists while becoming the 127th player in NBA history to play in 1,000 regular-season games. ”It looks like his 100th game, the way he’s moving out there,” Thompson said. Thompson made his initial four shots and Green scored eight quick points, connecting on his first three field goal attempts. 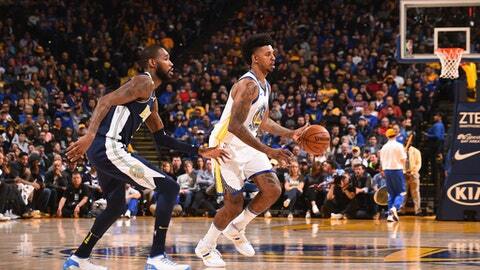 He handed out five assists as Golden State raced ahead 27-20 – a far cry from the Warriors’ previous performance in a 96-81 loss to Denver at Oracle Arena on Dec. 23. The Warriors shot 3 for 27 in that game from 3-point range but topped that with four 3s in the first quarter Monday and finished 13 for 30 from deep. Thompson’s 3-pointer with 4:10 left in the third made it 78-71 after Denver had tied the game 89-all at the 6:57 mark of the period. The Nuggets held the Warriors to a season-low scoring performance here last time that snapped their 11-game winning streak. Golden State has won seven of eight since. Denver got 22 points from Gary Harris, and 21 apiece from Jamal Murray and Trey Lyles. Kerr said Durant ”didn’t feel quite right” after going through shootaround earlier in the day. Green was fined $25,000 by the NBA for publicly criticizing the league’s officiating in comments after Golden State’s 121-105 win against the Clippers on Saturday. Nuggets: Denver limited its turnovers to 11 after committing a season-high 26 at Sacramento two days earlier that led to 40 Kings points. … Denver is 3-11 on the road vs. Western Conference teams. Warriors: Andre Iguodala hit his first 3-pointer in nine games he’s played since Dec. 18, snapping an 0-for-12 funk from deep when he made one in the first. … Golden State rookie Jordan Bell took a hard fall in the second quarter and moved gingerly afterward. … Newly crowned U.S. figure skating national champion and Olympian Nathan Chen attended the game, watched Curry’s warmup and was set to meet him afterward. Nuggets: Host the Atlanta Hawks on Wednesday. Warriors: Host the Los Angeles Clippers on Wednesday seeking a 13th consecutive victory in the rivalry.